Goe Oil is a combination of 28 plant fruits, flower oils & butters. Lightly scented with Monoi from Tahiti. 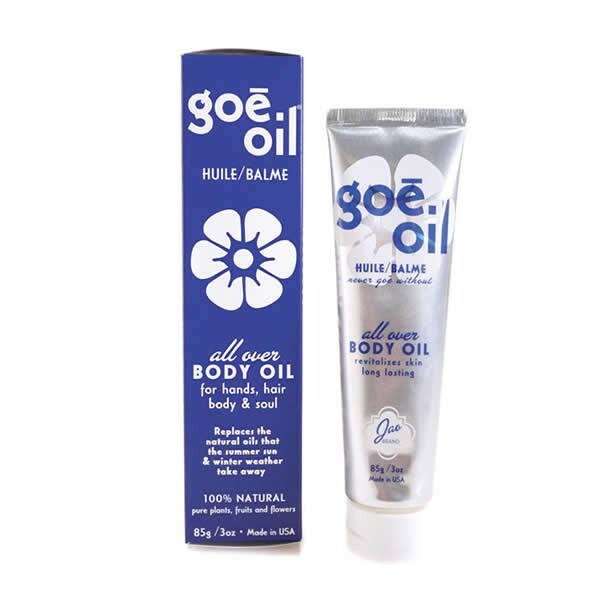 Goe oil goes into the skin quickly leaving it incredibly smooth. Lighter than typical body butter, longer lasting than a moisturizer. A high percentage of Jojoba oil (technically not an oil); it’s a polyunsaturated liquid wax similar to sebum. Sebum is secreted by the human sebaceous glands to lubricate & protect skin & hair. Jojoba oil can be used to replicate sebum oil. Goe Oil is unique because it replaces natural oils we tend to lose due to age, environmental stress & weather. This unique product should be used all over the body after shower or shave ~ in the hair ~ feet ~ hands ~ anywhere & everywhere. You’ll never Goe without… 100% natural – pure plants, fruits and flowers NO parabens, sulphates, PEG’s propylene glycol, TEA, DEA, phthalates, mineral oil, silicones or synthetic fragrance. Goe Oil Ingredients: Jojoba Butter, Sunflower Oil (Helianthus Annuus), Jojoba Oil (Simmondsia Chinesis), Monoi Tiare (Coconut Oil, Gardenia),Rice Bran Oil (Oryza Sativa), Avocado Butter (Persea Gratissima), Grape Seed Butter (Vitis Vinifera), Grape Seed Oil, Cocoa Butter (Theobroma Cacao), Meadowfoam Seed Oil (Limnanthus Alba), Rose Hip Oil (Rosa Rubiginosa), Soy Lecithin, Pumpkin Seed Butter, (Cucurbita Maxima), Mango Butter, (Mangifera Indica), Cupuacu Butter (Theobroma Grandiflorum) Avocado Oil (Persea Americana), Shea Butter (ButyrospermumParkii), Hemp Seed Oil (Cannabis Sativa), Kukuinut Oil (Aleurite Moluccans), Chamomile Oil (Matricaria Chamomilla), Beeswax (Cera Alba), Calendula Oil (Calendula Officinalis), Essential Oils Tocopherol (Vitamin E), Vitamin E, Acetate, & Rosemary Extract.